Hamlet once said “We are living in extraordinary times and extraordinary times require extraordinary measures”. Although this statement is now 400 years old – it is probably even more relevant today than it was in Hamlets’ time; and never has the Health Care Sector seen such extraordinary times as these we are living in today. Recent events have proved that even Hospitals are not immune from the pressures of the economic climate and the bastions of the NHS are now being threatened by a surging tide of Private Health Care organisations springing up offering a competitive service. I dare say that Hamlet never had to find £22bn of Operational Savings or go cap in hand to the Government of the day for a further £8bn…or even worry about a 5 Year Forward View (5YFV). Hospitals and Trusts in serious debt, investigations into poor practice, the patients now having a greater choice of where they get their health care, increasing pressure to achieve Government targets etc – all seem to describe the “extraordinary times” in which we are living … which is why…we need strategies which will create “extraordinary measures” in order to thrive in such extraordinary times. And, in an unprecedented move, the Chief Nursing Officer for England said; “Nurses will now be formally judged on the compassion they show in treating patients with dignity and respect”. 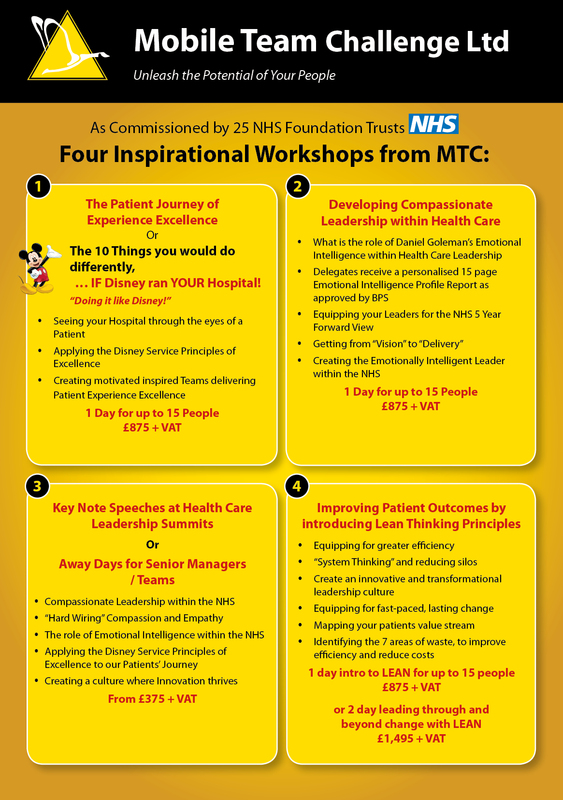 Our range of Workshops have been specifically tailored and designed to deliver “extraordinary measures strategies” to the Health Care Sector in order to achieve Patient Experience Excellence in our Hospitals and Care Homes and to ensure that our Health Care and Patient Care Professionals adopt the correct “Winning Attitudes and Behaviours” to embrace the current challenges whilst increasing their Patient Focus and Patient Compassion. Click here to download an overview of these 4 Inspirational Workshop Offerings. Click here to download the When Clinical Intelligence Meets Emotional Intelligence PDF. How do your 8 Emotional Intelligence Behaviours stack up when you’re under Pressure? 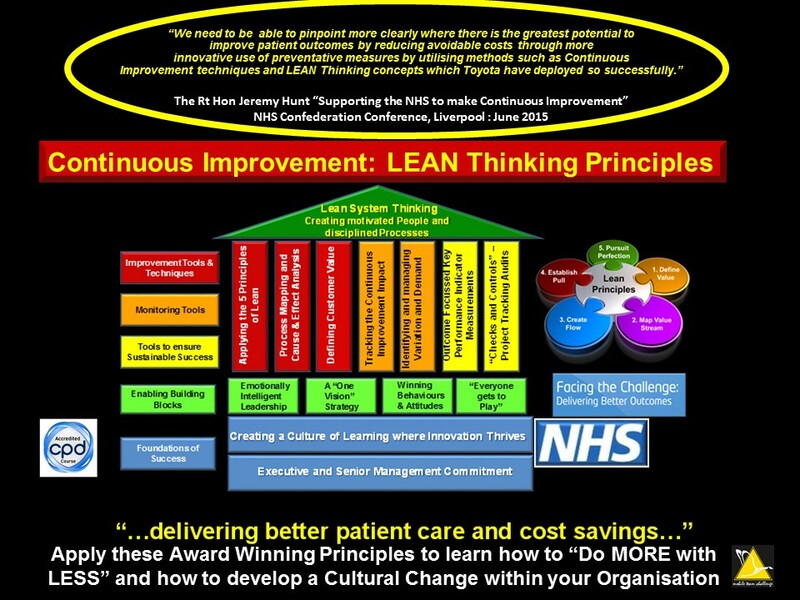 So…what IS Lean Thinking and HOW can it help the NHS in their cultural change programmes? Lean is a unified approach to achieving improved performance, which, when correctly deployed, will drive continuous improvement, or even dramatic step changes in performance, and will be a major enabler in achieving the goal of becoming an “Outcome Focussed Organisation”. From integrating quick pace transformational change to maximising customer value whilst minimising waste, the Lean Continuous Improvement principles create the Winning Behaviours and Attitudes across the “people and processes” across any organisation. “We must become far more disciplined in managing project programmes with less dependency upon a few key individuals and more systematic and rigorous approach to project and programme delivery across the whole organisation” – is a strategic statement of intent which we hear on a daily basis from many organisations and the implementation and practice of the transforming 5 Principles of Lean and Continuous Improvement are the perfect vehicle required to achieve this desire. In the current political and economic climate there is a focus on public services to do more for less, i.e. to be more efficient. NHS departments and local authorities are in the process of working on the detail of how budget cuts will be implemented. An important methodology at the disposal of public sector managers is Lean, which can deliver many benefits. The approach can be applied in many situations and is equally relevant within the private and public sectors. Many major organisations have already adopted the methodology of Lean and they are experiencing remarkable improvements as a result. Using a rigorous data based approach, Lean encompasses an extremely wide and comprehensive toolkit as well as a structured methodology for deploying these tools, to increase customer satisfaction, drive out errors and waste, reduce cycle times, reduce costs and improve delivery. In today’s volatile healthcare environment, health information managers are being asked to do more with less—less staff exertion, less technology, less time, and less workspace—while providing patients, physicians, nurses, and administrators with a high level of service. To meet increasing demands, HIM professionals can join their healthcare colleagues in looking to lean thinking, a philosophy of management that focuses on process improvement and change management. Lean thinking can be used to identify and eliminate waste in any activity performed within a facility. 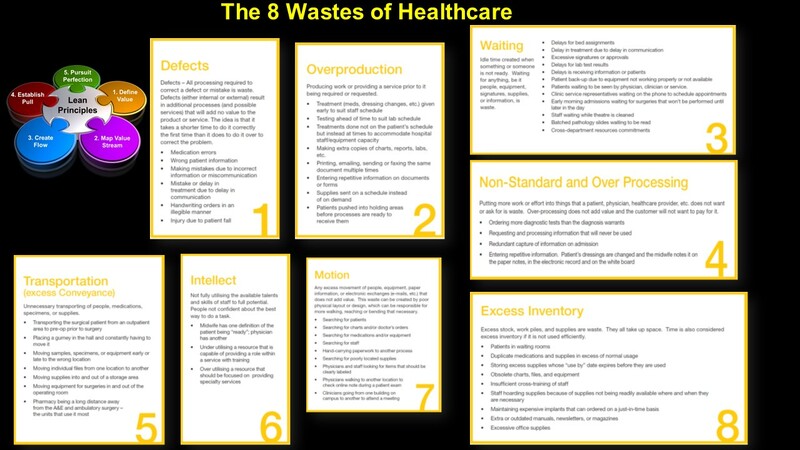 Based on the Toyota model, lean thinking focuses on how efficiently resources are being used, and with each step in a given process stops to ask “what value is being produced?” The method can be used to improve service to any group within a facility, including eliminating processes that offer no value to healthcare’s ultimate customer: the patient. 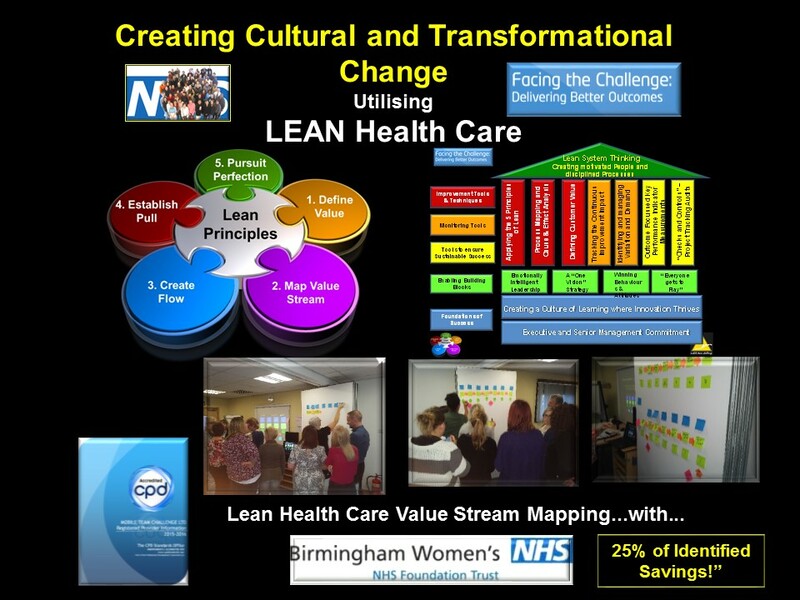 Recently when running this 2 day workshop at Birmingham Women’s Hospital – the team completed a Value Stream Map of their Patient Outpatients – Patient Journey and identified 25% in efficiency savings and also 8 Areas of Waste which they have now created Lean project Teams to address. What IF … Disney ran your Hospital or Care Home? In a survey of 337 NHS Chief Executives and Chairs, 100% of NHS leaders concede that the NHS is not sufficiently customer focused at present. Of those, 65% said that a significant change in customer focus is required. The public agrees – 93% think it’s important for the NHS to pay more attention to customer service. Areas cited for improvement include friendlier staff, easier appointment booking systems, clearer information about treatment and better bedside manner. A FUN, Inspirational and Motivational 1 day Workshop for up to 12 delegates. 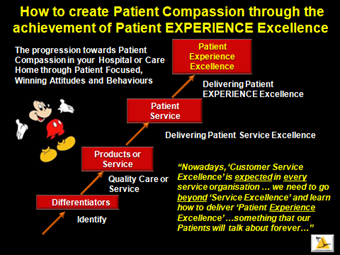 Creating a Vision of Compassion and Patient Experience Excellence for all Health Care and Patient Care Professionals. 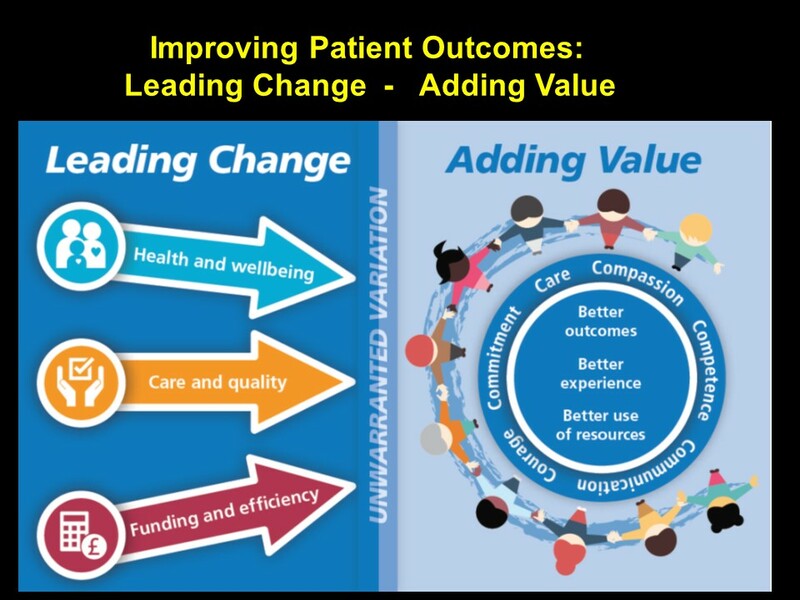 Applying Compassion, Courage, Competency, Communication, Care and Commitment through Patient Experience Excellence through the creation of Patient Focused Winning Attitudes and Behaviours. What if…we did things Differently? …and What if…Disney ran your Hospital?! Consider the Service Principles of FISH! Our moods and emotions influence our behaviours on every workplace interaction and relationship. They influence fundamental areas like empathy, decision making, resilience to pressure, motivation / engagement etc. Showing a genuine concern (empathy and compassion) for patients’ needs, smiling and making eye contact are all critical to a patients’ perception of service quality and patient experience. Importantly, research has shown that GP’s with a higher level of emotional intelligence have a faster rate of patients returning to full health after illness. Doctors, Nurses and Hospital Staff who are high in emotional intelligence are able to manage their own impulses, communicate with others effectively, manage change well, solve problems and use humour to build rapport in tense situations. These people will have empathy, remain optimistic even in the face of adversity, are gifted at educating people in difficult and sensitive situations and/or handling complaints in a service role. Understanding our Patients through the development of the Emotional Intelligence in our Staff is the key to ensuring that we retain our differentiator by delivering a Patient Experience which will never be forgotten. Emotional Intelligence is what makes your Staff and your Hospital stand out from the crowd. Why is it important to develop Emotional Intelligence within Health Care? A total of 43 managers from a range of disciplines and with varying levels of seniority, employed in an NHS mental health setting, participated in a research project looking at emotional intelligence (EI) and leadership styles. All of the participants completed the electronic versions of Emotional Quotient Inventory and Bass and a Leadership Questionnaire. Four groups of leaders were then produced, based on overall EI and transformational/transactional leadership scores, and were compared across the groups. The results showed a statistically highly significant difference between the groups, and it was concluded that a strong relationship existed between high levels of EI and high levels of transformational/transactional leadership styles. This study shows that a significantly different style of leadership can reasonably be predicted when a high EQi score is encountered, and that a high transformational/transactional leadership score implies that a high EQi score is also highly likely to be present. No evidence was obtained about causal direction to explain whether EI causes a particular leadership style or vice versa, and further research using a larger sample is recommended. 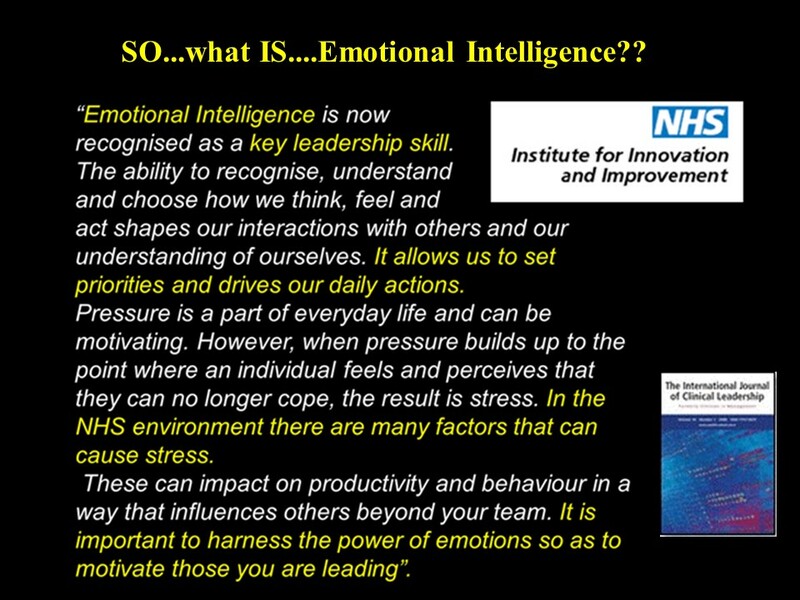 The evidence of the above and similar experiences from our work with hospitals in the UK indicates that there is a very close correlation between Emotional Intelligence and Leadership Skills. Our proposal for the Enhanced Communication Skills Module is to run a one day workshop on all 8 behaviours of emotional intelligence – all of which are paramount to professional communications from transformational leaders. Develop a greater understanding of all “self” behaviours leading to increased professional communication skills. Empathy and Compassion is an emotional capability closely associated with Emotional Intelligence (EI), and the good news is that (unlike our Intelligence Quotient which is thought to largely fixed by early adulthood), we continue to develop emotional awareness and social skillsthroughout our lives… If… we choose to. The development of these 8 behaviours will create transformational leaders. The Chief Nursing Officer for England recently said; “Nurses will now be formally judged on the compassion they show in treating patients with dignity and respect”. 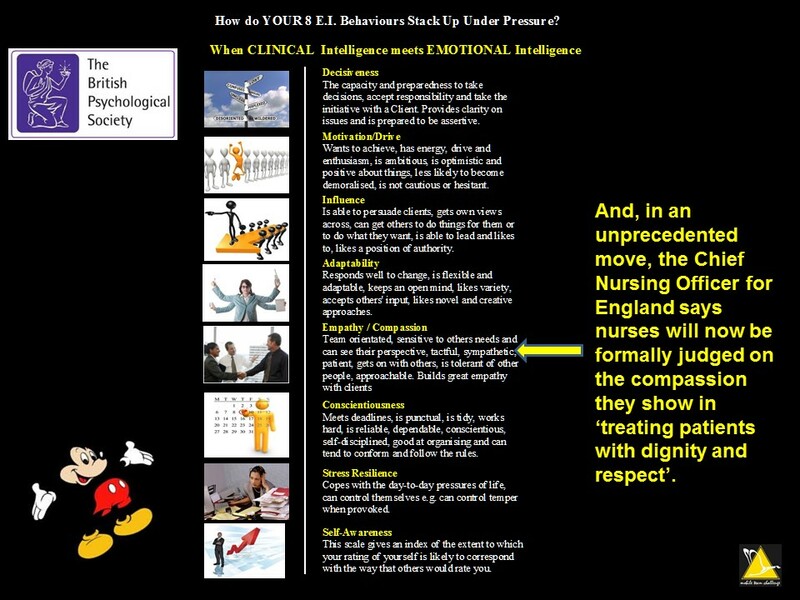 Compassion and Empathy are measurable as Emotional Intelligence Behaviours and many Hospitals are using E.I. Tools to measure competencies and developmental needs of their Staff. The cost of this module is £875 + VAT for groups of up to 12 delegates. This cost includes all preparation, materials, workbooks and trainers expenses. It is recommended that all delegates complete an E.I. Profile Reports prior to attendance: £65 + VAT per delegate for a 16 page advanced report. If a delegate has already had an E.I. 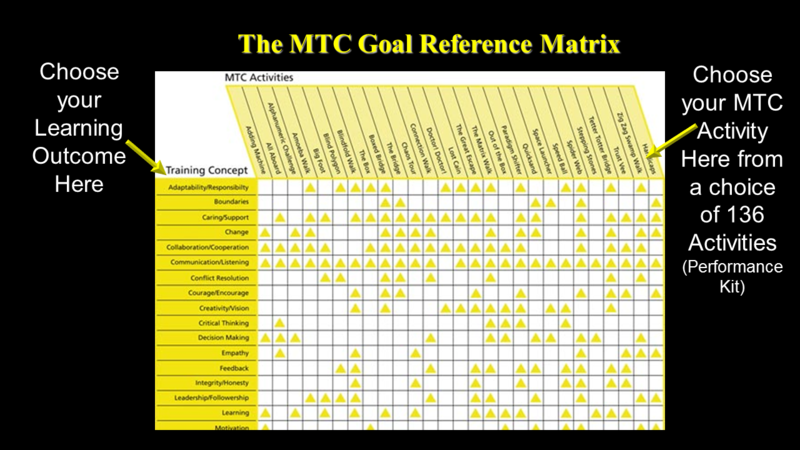 Profile Report for any of the previous MTC workshops then it will not be necessary to complete another test. Improving responsiveness and securing greater patient and public engagement in health care has been a policy priority for decades, in spite of this, some of the recent reports and studies can suggest that the typical NHS experience can be far from patient-centred. There can sometimes be a lack of focus on engaging patients in their own clinical care, despite strong evidence that this makes a real difference to treatment outcomes. Among the many factors that influence the quality of interaction between patients and front-line healthcare professionals is the personality preferences of the individuals involved. The new Myers-Briggs Report for Healthcare Professionals from MTC provides invaluable insight for individuals and their managers to support the necessary shift in expressed behaviour to foster a mutually rewarding patient-centred service. Designed exclusively for healthcare professionals, the report highlights how they deliver information to and spend time with patients, and explains why misunderstandings and conflicts may sometimes arise when giving care. Recognising that caring can often take place within a stressful environment, the report also describes the impact of work stress as it affects care style, and provides tangible advice for ‘how to get yourself back’. This one day workshop will focus on the 3 primary emotional intelligence behaviours of; Influence, Empathy and Self Awareness. Experiential Activity: Levitation Challenge– an activity to demonstrate, and practice, how to overcome conflict and to create “win-wins”. The cost of this module is £ 875 + VAT for groups of up to 12 delegates. This cost includes all preparation, materials, workbooks and trainers expenses. If required, E.I. Profile reports are £65 + VAT per delegate for a 16 page advanced report. This one day workshop will focus on the 5 primary emotional intelligence behaviours of; Decisiveness, Motivation, Influence, Empathy and Self Awareness. Great teams like this have learned how to work together to produce extraordinary results – this Mobile Team Challenge Workshop will help create such skills within a team leader and will enable them to create high performance teams. This “Leading the Team” programme from Mobile Team Challenge has become the defacto standard across 52 RAF bases in the UK as well as Afghanistan, Cyprus, Falklands and several overseas stations, including the RAF Red Arrows Display Team, where over 3,000 RAF personnel have participated in the MTC experience of learning how to Lead their Teams. The workshop is based around Stephen Covey’s bestselling book – The 7 Habits of Highly Effective People – and the workshop will apply the 7 habits to assist Team Leaders in the development of a highly effective team. Learn how to use Appreciative Inquiry tools, allowing the creation of shared visions and “buy in”. This half day workshop will focus on the 6 primary emotional intelligence behaviours of; Stress Resilience, Decisiveness, Motivation, Influence, Empathy and Self Awareness. “Stress is likely to become the most dangerous emerging risk to business in the early part of the 21st century“… so says the Association of Insurance and Risk Managers. Pro-actively identifying the dis-stress creators and the ‘early warning’ signs of stress and distress is critical to our understanding as to the dangers lurking in our homes and our workplaces. Lifestyle awareness and stress management are the keys to healthy well being and motivated individuals. This half day workshop will look at the causers of stress and will advise the delegate what they can do to eliminate the stressors in their life. This workshop is also vital for Team Leaders as they explore the impact of their leadership style upon their reportees can actually be the cause of stress. Consider the root causes of dis-stress and stress in the workplace according to Dr Hans Selye. Explore the 4 sources of Distressors: Environmental Factors, Social Factors, Physiological Factors and Thoughts: delegates will consider where they feel they are most at risk. Undertake a simple questionnaire to establish what their personal vulnerability to stress is. Identify their leadership style and will explore the impact that their style has on their Team members. Explore the impacts that CHANGE has on individuals utilising the Kubler-Ross Change Curve and learn how to implement change causing as less stress as possible. Learn how to control their bio-rhythms utilising personal monitoring with Heart Math bio-feedback monitoring as used by RAF pilots in combat. The cost of this module is £450 + VAT for groups of up to 12 delegates. This cost includes all preparation, materials, workbooks and trainers expenses. If required, E.I. Profile reports are £65 + VAT per delegate for a 16 page advanced report. This half day workshop will focus on the 6 primary emotional intelligence behaviours of; Stress Resilience, Decisiveness, Motivation, Influence, Adaptability, Empathy, Conscientiousness and Self Awareness. Hamlet once said “..we are living in extraordinary times… and extraordinary times require extraordinary measures…” if this were true in Hamlet’s day, it is certainly true it today’s NHS and as we have sadly seen, the Health Sector is not immune to the austerity climate in which we work today. This half day workshop inspires and motivates delegates to see change “differently” and to assist them with the tools and techniques required to create their “extraordinary measures”. This half day workshop on “Leading through, and beyond, Change” will prepare the delegates for the future challenges and adventures. Develop a better understanding of the emotional effects of Change and the softer skills required to implement behavioural and attitudinal change with the Kubler-Ross Change Curve. Learn what is expected of them during Change? 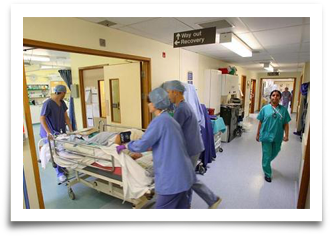 The Chartered Institute of Marketing believes that if marketing is used effectively it can be instrumental in reducing costs by enabling hospitals to segment their customers into clearly identifiable groups which have specific and quantifiable needs. By doing this, hospitals are able to allocate funds where they are most required and, at the same time, reduce unnecessary spending. Patients will also be able to have a bigger say in the development of hospital services as marketing disciplines will encourage all hospital staff to solicit, and listen to, patient feedback through a variety of qualitative and quantitative styles utilising methods ranging from surveys, questionnaires, and social marketing techniques. This workshop will apply commercial marketing concepts and business strategies to Medway Community Health’s service strategies; Mobile Team Challenge Marketing specialists will work with MCH to clarify the content and learning outcome requirements. “Each and every participant spontaneously felt that they ought to come individually and tell me how fantastic your course was! They felt really motivated, learnt a lot and really enjoyed the day”. “An excellent course – very professional and well presented. Thank you”. Click below to take our free Emotions and Behaviours at Work Assessment. To create a new trial account please enter your e-mail address and click on the submit button so we can send you the account information.